Atlantic Shopping operates from three huge warehouse facilities, operating an enormous area of over 120,000 square foot. As a business we are firm believers in holding large amounts of stock so as to give both our domestic customers and business customers a fast, efficient, first-class service. Our current stock levels exceed 55,000 products- meaning you’ll never be short of options, whether you require one product or 10,000. We supply numerous high-profile clients across a range of different sectors, from exhibitions to the TV & media industry, the cosmetic industry to the transport industry, and we’d be happy to help you with any new or existing ventures. If you have any questions, or you’d like to speak to a member of our team, please contact us, and one of our trained advisors will be more than happy to explain things further. What separates us from our competitors is the fact that we have our own design and manufacturing facility, giving us a completely unique position within the furnishings industry marketplace. This important distinction not only enables us to design our own products, but also means that we can source and produce any design you wish. 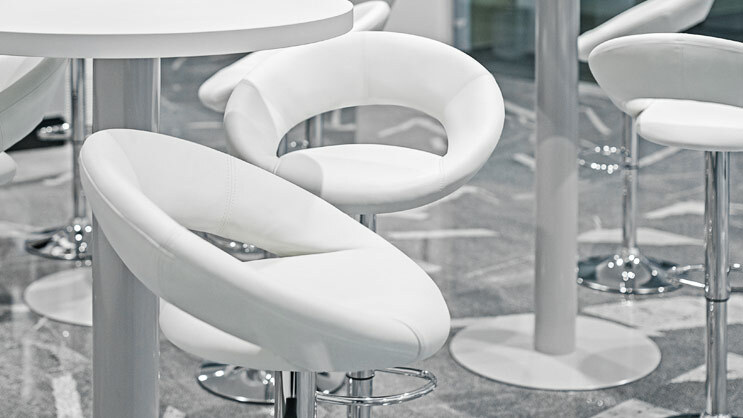 Due to our extensive stocks, logistical operation and 40 years of experience in the business, we are ideally set up to serve all clients looking for contract furniture. Our low costs and Free Next Day Delivery service mean we can provide our clients with any items at any time, and at a competitive price. Whether you’re looking to furnish your home, a new bar, a chain of shops, a multinational company sales area or even a kitchen showroom, we will do everything we can to help you achieve the very best results. If you need any help at all, please don’t hesitate to get in touch using the details below. Our friendly team are on hand seven days a week; to make sure you find exactly what you need. If you'd like to find out more about what we do, head to our about us page.